Just in time for Halloween, you can now have breakfast with your favorite CEREAL killer! 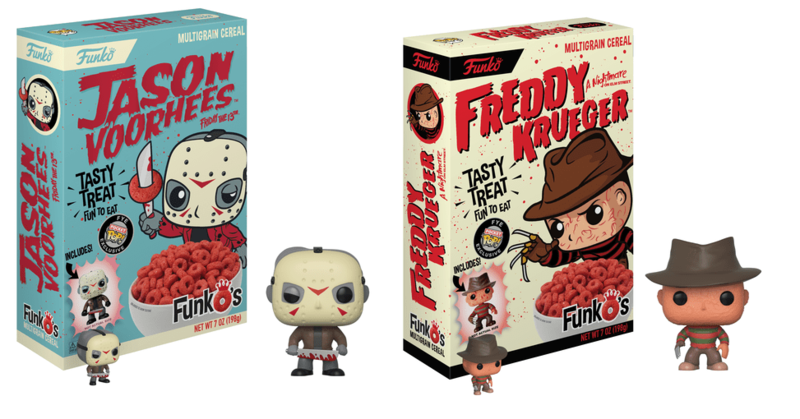 A company called Funko that manufactures plush toys, action figures, and apparel, but are mostly known for their anime-style, pop culture dolls with big heads, have announced a new line of multigrain breakfast cereals that are hauntingly fun. Feel like you’re sitting at a picnic table at Camp Crystal Lake. Don’t look now, but there are bloody O’s in your bowl! You know how there are times that you are so tired that you want to fall asleep in your bowl of cereal? Well, you don’t want to do that with Freddy Krueger around! They’re not clowning around with this Pennywise cereal. Take a milky dip with The Mistress of the Dark. If you’re not into a horrifying breakfast, you can now sit at the kitchen table with the Golden Girls. The box features the Funko-versions of all four characters and comes with a Rose doll. So the real question is where can we find these? It depends, actually. According to the Funk’O website, some types of their cereal could be available at Hot Topic, GameStop, FYE. Some Target and Walmart locations carry the cereal as well (check cereal isle as well as the toy section).